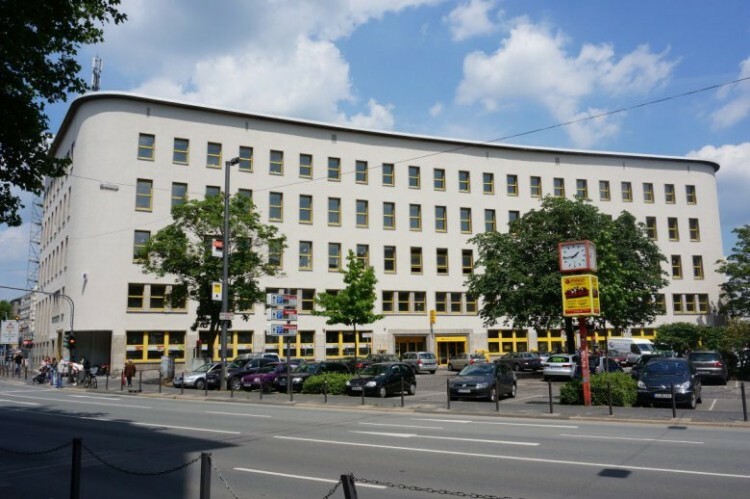 Do not miss the opportunity to buy an office building in Wuppertal (land - North Rhine-Westphalia). The object was built in 1930 on a plot of 8,136 sq. m. There is a private parking and an underground garage for 460 cars. Earlier in this building was the central post office of Wuppertal. In 2015, the building passed into private hands to its current owner. As a result, the building was converted into commercial real estate, where many tenants were located. The building is in very neat and tidy condition. 1) Retail grocery chain supermarket Netto. 14.7% of the total area is rented. The lease agreement is valid until August 24, 2033. 2) Postbank branch (Postbank in Germany serves more than 20 million individuals and about 300 thousand legal entities). 14.9% of the total area is rented. The lease agreement is valid until 12/31/2023. 3) Engineering company CPM GmbH. Rent 21% of the total area. The lease agreement is valid until May 31, 2026. 4) Hotel VESPER. They rent 23.1% of the total area. The lease agreement is valid until December 31, 2040. 5) Fitness Studio Mc FIT. Rent 12.1% of the total area. The lease agreement is valid until December 31, 2027. In addition, the site has many smaller tenants: the law firm RA Kanzlei, the digital electronics store Handyshop, the bio-products store Lebensmittelh, the Schuelerhilfe training center, the telecommunications company Telekom, the medical office Arztpraxis. Total area - 13 898 sq. M.
Wuppertal is a city in Germany, in North Rhine-Westphalia. Subordinated to the administrative district of Dusseldorf. Part of the district is a city of land subordination. To Düsseldorf - 35 km, to the city of Cologne - 50 km. The population of the city is 350 thousand people. Within a radius of 50 km. population is 5 million people. The property is located in the very center of Wuppertal. Near excellent infrastructure. At 100 meters is the pedestrian area of the city with many shops, cafes and restaurants. About 200 meters from the main railway station. The bus stop and taxi rank are located directly in front of the building. The University of Wuppertal (19,000 students) is about 3 km away. The nearest A46 motorway is 1.6 km away. Dusseldorf International Airport is 44 km away and can be reached by car in 20 minutes.